While there have been many live-action and animated movies in the alien encounter/invasion genre, 20th Century Fox and DreamWorks’ Home is a family-oriented colorful and fun addition to the pantheon of alien-based films. Although messages such as conquering fear, understanding others, and commitment are commonplace in the friendlier variety of alien movies, this film combines the fanciful plot with rich subtext that acts as social commentary on issues such as ethnocentrism, imperialism, and colonization. These social issues are as real today as they were centuries ago. Just like Dr. Seuss was a master at breaking down complex adult issues into a form that a child could understand and adults could appreciate, DreamWorks provides us with a movie that pairs a comical narrative with real-life societal issues from which we may be able to gain a better understanding of what it’s like to be the nation invaded by another for a supposed greater good. 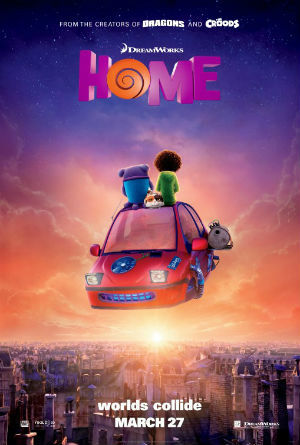 Home is about an alien race, known as the Boov, who has decided to invade earth and relocate the human ace to Australia. The Boov are running from another alien race, known as the Gorg, and need to find a new home. Upon invading earth, the Boov setup new neighborhoods on the Australian continent and relocate all the “humans persons” to their new “home” as the Boov move in to claim this new planet for their own. Evading the forced human transport, Tip (voiced by Rihanna) hides from the alien race in an effort to buy time so she can develop a plan to find her mom (Jennifer Lopez). Whilst on her mission, Tip encounters an outcast Boov named Oh (Jim Parsons) who is running from his own race because of a massive eVite he sent out to the entire galaxy for his “warming of house” party. Unfortunately, this eVite is also sent to the Gorg. Hot on the trail of Oh is traffic cop Boov Kyle (voiced by the incomparable Steve Martin). During their respective missions, Oh and Tip must learn to tolerate one another and understand one another if they are ever going to find Tip’s mom and Oh stop the Gorg from invading planet Earth. Home is the type of animated alien movie that will likely evoke nostalgic memories of Disney’s Lilo and Stitch and possibly, to some extent, DreamWorks’ Shrek. However, after How to Train Your Dragon 2 lost to the lesser film Disney’s Big Hero 6 at the Academy Awards BUT won against it at the Golden Globes, the embattled DreamWorks needed its only offering for 2015 to come in like, not to quote Miley Cyrus, a wrecking ball. Instead, it played it safe; and in doing so, it did not capture the imaginations and attentions of audiences like it should have. DreamWorks needed Home to be its Lilo and Stitch. But, instead, it will likely go by way of the Croods. Somehow, a lonely Hawaiian girl and ill-tempered koala bear-like alien creature found its way into the hearts of audiences but Home will not likely do the same. This is probably because Home plays too close to Lilo and Stitch instead of breaking new ground and living on the edge. On the surface level, it is all too easy to see Home as a movie that is a tastes great but less filling version of Lilo and Stitch, but a closer look will reveal subtext that the Disney classic could only dream of. While both films deal with the idea of understanding one another and learning to cooperate, Home provides us with a deeper meaning behind the one-dimensional, vapid plot. It takes the idea of learning to understand one another and friendship development further by allowing us to view the invasion/encounter from both sides. In an effort not to spoil the twist at the end of the movie, I will no go into great detail. But, it is very clear to see that this movie can be read as social commentary on the U.S. invasion in the various middle-eastern countries. Note: this movie is not suggesting it is wrong to fight those who aim to harm you, but it is suggesting that in an effort to do good that there are sometimes negative consequences that may occur to a people or society. Sometimes, while a nation believes it is BRINGING civilization to a people, seen as lesser, it is entirely possible that they are actually TAKING from the native people instead. For the anthropologists in the audience, you will greatly enjoy the themes in the movie that will likely get missed by the typical movie-goer. After the previews of Home built up a general interest and excitement for the animated movie, it will unfortunately disappoint most movie patrons who choose to see it this weekend. However, it is still a very cute movie that will keep you and your kids mildly entertained for the appropriate runtime of an hour and a half. I hope that after this movie does not perform as well as projected, that it inspires DreamWorks to rethink their approach to the next movie. I’ve seen great potential in the stories DreamWorks tells, and many of them are better cinematically than the Disney-Pixar ones; but, they need to bring the creative geniuses at their studio together to focus on rebranding despite the fact the Oscars always favor Disney-Pixar just because of the brand.